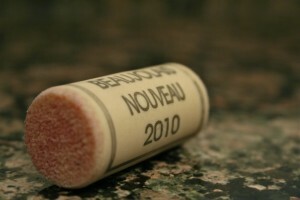 Can you drink a 2010 Beaujolais Nouveau a year and a half after release? I’ve actually received several variations of this question and it’s popped up in the keyword search results of people visiting A Glass After Work. Beaujolais Nouveau are very fruity with a fairly light body and very little tannins, so it isn’t meant for aging. In fact, the whole purpose of the wine is that it’s a young, immature wine that should be consumed quickly. The wines are supposed to give an indication of how good the Beaujolais from that year will be. That said, if you have a bottle, grab it and open it up! Keeping it isn’t going to make the wine taste better, but at the same time, there’s no point in throwing a bottle of wine away without trying it. The worst that happens is you don’t like and you throw it away.